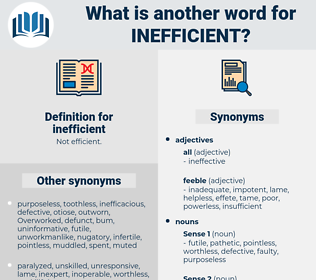 What is another word for inefficient? 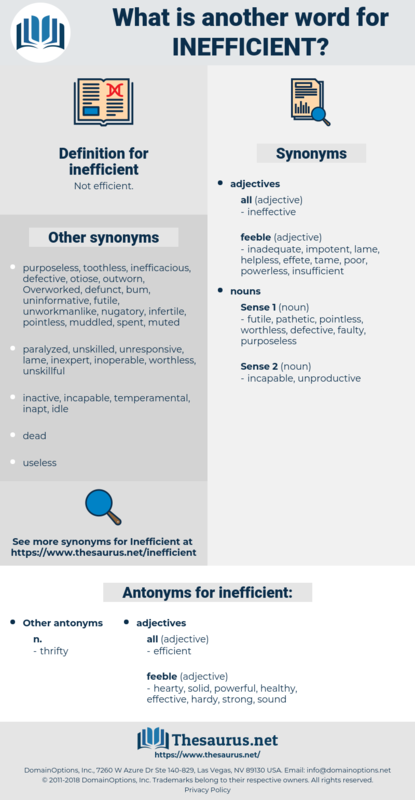 inappropriate, efficiency, invalid, unworkable, useless, defective, fruitless, futile, effectiveness, flawed, bad, feeble, energy-efficient, incapable, vain. incompetent, insufficient, inadequate, counterproductive, deficient, inept, wasteful, unprofitable, uneconomic, unsuccessful, cumbersome, toothless, unproductive, weak, cost-effective, unsatisfactory, unwieldy, dysfunctional. hearty, solid, powerful, healthy, effective, hardy, strong, sound. dexterous, proficient, skillful, experienced, adept. capable, expert, useful, competent, able. helpful, operant, profitable, worthwhile, beneficial, expedient, successful. Sophia smiled at the agitation, and at the inefficient management which had never thought of food. The Spanish General Romana, was to take a part in this movement; his small and sadly inefficient force had approached the left of our army, or rather we had drawn towards his position, and he was, I believe, perfectly willing to lend all the assistance in his power, in the contemplated attack; but our General, I fancy, did not calculate upon any material help, from a force so greatly out of order as his was said to be.